Posted on August 24, 2018 at 3:24 pm. FOR the second-consecutive week BGO Casino is giving players the opportunity to win a share of 50,000 free spins on well-known slot Jumanji. 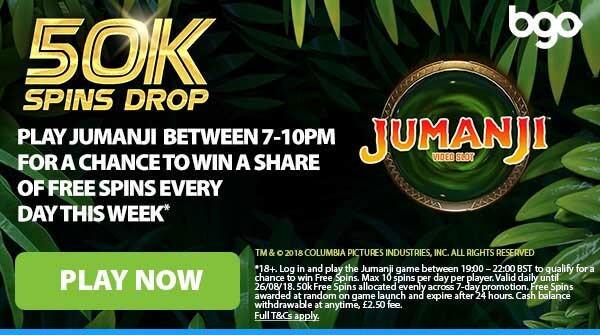 To be in the running to win a share of the 50,000 free spins, you need to log-in and play Jumanji between 7pm and 10pm BST up until August 26. This promotion is open to every player with a BGO account as long as you are from a country which is not on the restricted list. Every player who launches the game between the correct hours can win up to 10 free spins, which they will have 24 hours to use, before they expire. The promotion is only open to players aged 18 years and over and can be accepted by both old players at BGO and new account holders. ** 18+. Log IN and play the Jumanji game between 7pm and 10pm BST to qualify for a chance to win free spins. Max 10 spins per day per player. Valid daily until 26/08/2018. 50k free spins allocated evenly across 7-day promotion. Free spins awarded at random on game launch and expire after 24 hours. Cash balance withdrawable at anytime. £2.50 fee applies. Full T’s and C’s apply. BGO Casino has launched three new slots titles on Tuesday with customers now able to access them. The first of the new releases is called Tiger Claw, a Playtech slot with 4096 ways to win, with its highlight being a huge ferocious cat in the oriental wilderness. If you don’t find the legendary White Tiger you might strike another jackpot – with the game claiming to have the most legendary free spins bonus feature of all time. A new title from Scientific Games has also been released with a new Wonder Woman, 5-reel, 40 payline, video slot being released. The DC Universe hero will fight for good while you attempt to land some quality bonuses and free games. You can play the new slots titles at BGO casino by opening a new account.